Another nostalgic post about an old project that I’m purging from my closet… This time from late-1999 through mid-2000. 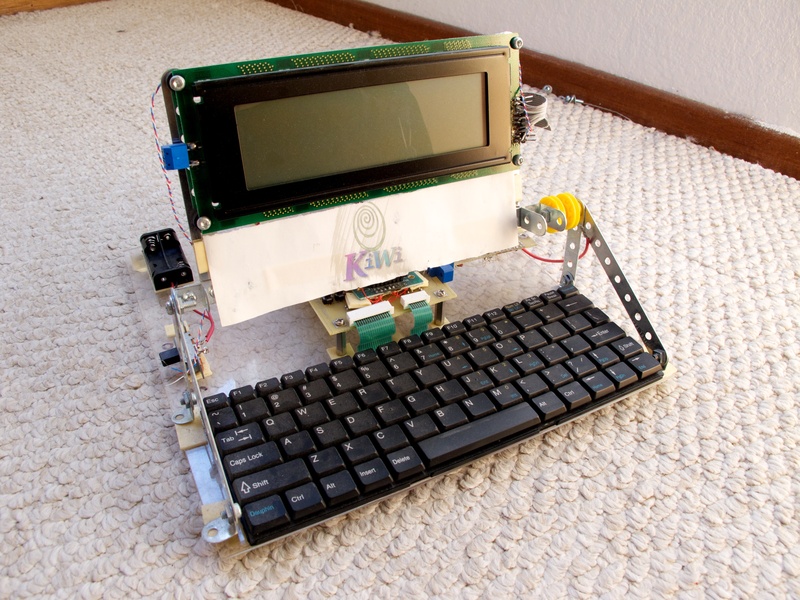 The Kiwi was a rather ambitious built-from-scratch Linux PDA that I spent my high school years on. My original goal for this project was reminiscent of the One Laptop Per Child project. I liked typing my notes, but of course laptops were prohibitively expensive. I wanted to design a very simple PDA, with a keyboard, that I could sell to my classmates for $100 a unit. A cheap laptop-style matrix keyboard, sourced from a surplus shop. Very low-resolution grayscale LCD, with no touch screen. With these tight constraints, the project was actually more like a souped up AlphaSmart than a bare-bones PDA. It ran uCLinux, and I could use the uCSimm board to start prototyping the software. This project eventually led to the PicoGUI project, as I needed a special kind of GUI to fit such a small device. And developing PicoGUI led to starting the CIA.vc service. The Kiwi prototype was done with a hellish combination of a custom PCB, wire-wrapping, and dead-bug surface mount rework. The PCB acted mainly as an SMT prototyping adapter. All the real interconnection was done with wire-wrapping, as I didn’t trust my design enough to bake it into a PCB right away. Of course, the one thing the PCB was designed to do, it didn’t. So the DRAM chip and serial level-shifter ended up grotesquely blue-wired. Despite the mess, this machine did boot Linux. I wrote my own bootloader for it, which I used for initial hardware bringup. It booted the uCLinux kernel from flash, and ran PicoGUI on the tiny LCD. Like most of my projects, it was never finished. PicoGUI took over as the focus of my attention, and I targeted my GUI at larger and less haphazard platforms. This entry was posted in PicoGUI and tagged big-project, embedded, linux, nostalgia, old-project on July 9, 2011 by Micah.